Antique bicycles and memorabilia are very popular. Antique bicycles are enthusiastically collected for a variety of reasons. Collectors appreciate the history, heritage, and artistic lines of vintage bicycles and have a desire to preserve them for future generations. Antique and vintage bikes are more than just conversation pieces. They can be restored and used as working transportation. Restoring these old bicycles not only keeps history alive, it is a great recycling project. If a bike is not worth restoring because of the cost, it can be used as a display piece. Parked in the front yard with a basket of flowers on the handle bars, it is unique yard art. Some people have hung the old bike frames on game room walls. Antique bicycles bring a bit of nostalgia anywhere they are displayed. The fist chain driven bicycle was developed around 1885. Prior to this time bicycles were pushed along by the movement of the rider's feet. As technology advanced, Victorian bicycles became an important method of transportation. These human-powered machines completely changed Victorian society and lifestyle. These bicycles were designed to resemble aircraft and motorcycles. They were heavy and cumbersome but parents and children alike were enraptured with the new look. By the 1960s bicycles were beginning to be simpler in style and less heavy. The change in weight allowed children to begin to experiment with tricks like wheelies and jumps, something that would have been impossible on the heavy bicycles of the World War I era. Like all antiques, bicycles are most valuable when the finish is original and in good condition. Before you decide to repaint, sand, or otherwise change the finish on an antique bicycle you should contact an appraiser that specializes in antique bikes. If the finish is very bad and you simply must repaint it, then it is important that you take careful photographs and notes about the original markings and colors. The color should not be changed and the original markings and design elements should be part of the design whenever possible. Restoring an antique bicycle is a very detailed and lengthy process. Here is an overview of the steps that you should take. Have your bike appraised by someone experienced. Decide if it is worth the time and expense of restoring. Take multiple images, including close-ups of the design elements and color of the original bike. Gently clean the bike and its parts. Begin to inspect the parts to see what might need to be replaced. Parts should be replaced with parts from a bicycle of the same make and year if at all possible. Investing in a good book about bicycle restoration is a good idea. Be sure to go slowly and ask questions before you do something that can't be undone. Some bicycles are just not worth restoring from a financial point of view because collectors aren't interested in them. Women's bikes, for example, do not have much desirability to collectors. 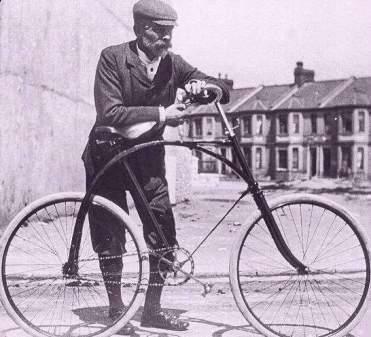 The Internet is an excellent resource for almost anything, including antique bicycles. Whether you want restoration advice, to chat with other people who share your interest in vintage bikes, or to find images to help you identify your bicycle you can find it online. Whether you decide to collect antique bicycles for a hobby or just want to restore your old 1960s stingray with the banana seat, you will be preserving an interesting part of transportation history. Vintage toys like bicycles and marbles bring back thoughts and memories of a simpler time for everyone.